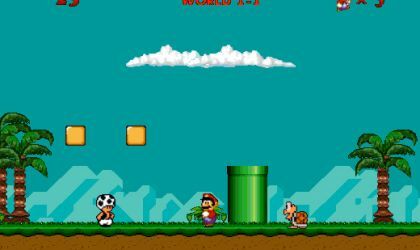 We have been adding a lot of Mario brothers games to Acid-Play over the last few days and to be honest this one is not the best. The Mario character is really small and very hard to focus on. 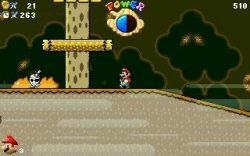 Controlling Mario in Super Mario PC is an absolute nightmare, this further detracts from the general gameplay. As far as I can tell there is no life limit, so you can get yourself killed as many times as you want, this should prove to be the most entertaining part of the game. Ultimately this is not a very good game. 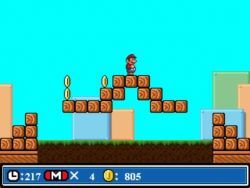 If you're looking for a Mario clone rather stick to games like Super Mario Forever. When I first saw this game I had a feeling I wanted to play it. The tricky controls made me die 300 times before I could finish level 1 but I enjoyed it and I am very happy I've tried it once. I detect things in this game that must have been difficult to make. Also this game reminds me of a little Mario game that you could play on a watch. It looks just like it! So it was not perfect but fun anyway. This game is so crappy that it is strangely entertaining. Mario is really small, the background dosen't join up and there is a useless square that has a skull and crossbones on it that keeps reaccuring. 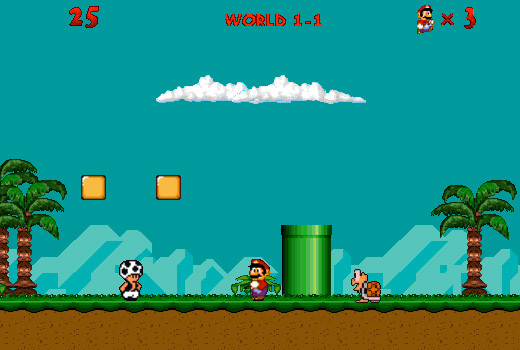 With the exception of mario TC this is the crappest mario clone ever. Download it NOW! Hi there! Well, this isn't much like the Mario game that I expected. You see, game is fun, but music could take a little work. And there are some sound effects missing. The game play is alright, and graphics as well. I guess I recommended you to download this game. What a pile of rubbish! I mean come on. What the hell is the skull-and cross-bones thingy at the beginning of the level. Red birds? I choose no on those. The music was bad too. I couldn't even play for more than a minute. First of all, the game is a French version so to install the game, you must decipher the language. 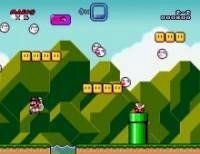 The screen is tiny and the actions such as jumping are slow and delayed. Possibly te worst Super Mario game ever. Terrible music, terrible graphics, Mario can hardly jump and nobody knows what the skull & crossbones thing at the beginning of the level is.